This mask is a quick and natural way to treat your skin with respect! 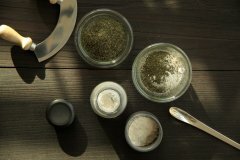 We have mixed the ingredients for you so you can easily do a fresh facial even in the morning before rushing off. 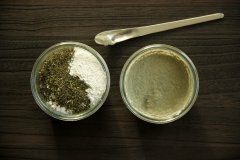 All you need to do is mix a teaspoon of the all natural mixture with a couple of tablespoons of water and apply it in a thick layer to your face and neck. Leave for no more than 5 min and then rinse off – no rubbing. And why would you want to do this? Because of what the ingredients* do for you. Because it evens out your skin, makes it so soft and it is organic. 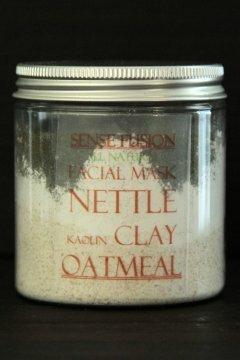 *Colloidal Oatmeal moisturizes and soothes your skin. It contains essential fatty acids, natural antioxidants and Beta-Glucan which is a proven active ingredient for anti-age skin care. *Kaolin White Clay is in particular good for sensitive skin and soothes irritated and red skin. It is rich in minerals that detoxifies the skin and balances the Sebum Production. 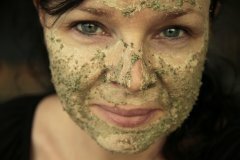 *Nettle Leaves Powder tightens the skin and is popular for its composition of antioxidants, rich on active minerals and plant substances.